The Cinémathèque Française building, designed by Frank Gehry. The Cinémathèque Française is a treasure that is sorely underused by visitors to Paris. This great institution is frequented mainly by French cinephiles, who are legion, but it also provides a valuable service to the world of international cinema: for each of its retrospectives, it seeks out and restores, with the help of its partners, copies of the films featured. 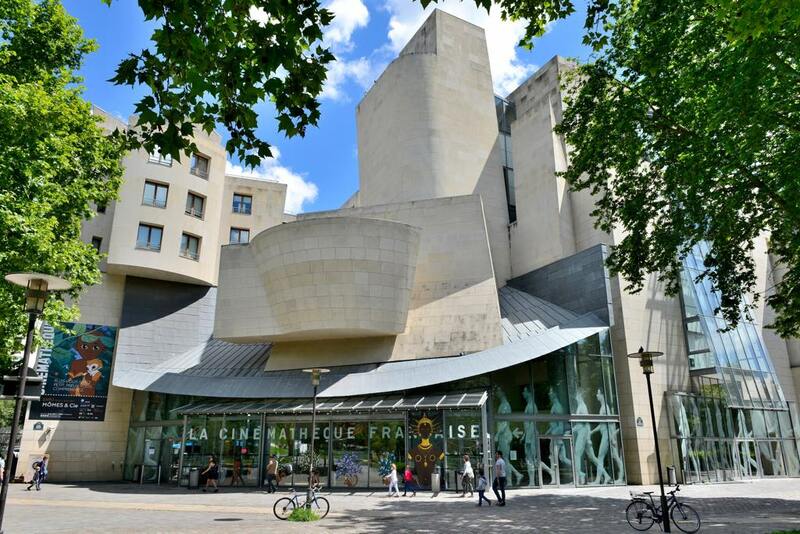 One of its other attractions for tourists is that it is located in one of only two buildings in Paris designed by American architect Frank Gehry (the other is the Fondation Louis Vuitton in the Parc d’Acclimatation on the other side of Paris). Added bonus: it is located in the Parc de Bercy and has a restaurant with a terrace. I must admit that although I knew that the Cinémathèque had a long history, I didn’t know how exciting it was. Founded by film archivist Henri Langlois and critic Lotte H. Eisner, it grew out of Langlois’ extensive collection of films, which was almost lost to posterity when the Germans occupying France ordered the destruction of all films dating from before 1937. Luckily, Langlois and his friends were able to smuggle much of his collection out of the country. Eventually, the collection found a permanent home in the Palais de Chaillot with the help of Culture Minister André Malraux, but at a price: it passed under the control of the French government, which in 1968 fired Langlois. The response from French and foreign film world personalities – everyone from Godard and Truffaut to Charlie Chaplin – was overwhelmingly prompt and loud, and he was reinstated. Today, the Cinémathèque owns one of the world’s largest collection of films and related documents and objects. Its exhibitions focus on the œuvre of one director (currently, Chris Marker) or other themes. Last week, the Cinémathèque announced the 2018/19 program, which will include retrospectives of the work of Lee Chang-dong, Ingmar Bergman, Sergio Leone, Jean Renoir, Elia Kazan, Billy Wilder, Agnès Varda, Bruno Nuytten and Joan Crawford, and exhibitions on spaghetti-Western director Sergio Leone and on Federico Fellini and Pablo Picasso, complete with paintings by the master. If you live in Paris, there is no excuse to not frequent the Cinémathèque, which charges only €6.50 for admission to films and €5 for exhibitions. For non-French-speaking visitors, there are plenty of English-language films on the program to choose from. So, do take your eyes off the cat video on the tiny screen of your smartphone and instead feast them on some of the treasures of film history in a real cinema.